The median price of a single-family home in King County was $726,275 in May, surpassing the record high of $725,000 set in April and up 15 percent compared to the previous year. The news isn’t all bad for home buyers, however. 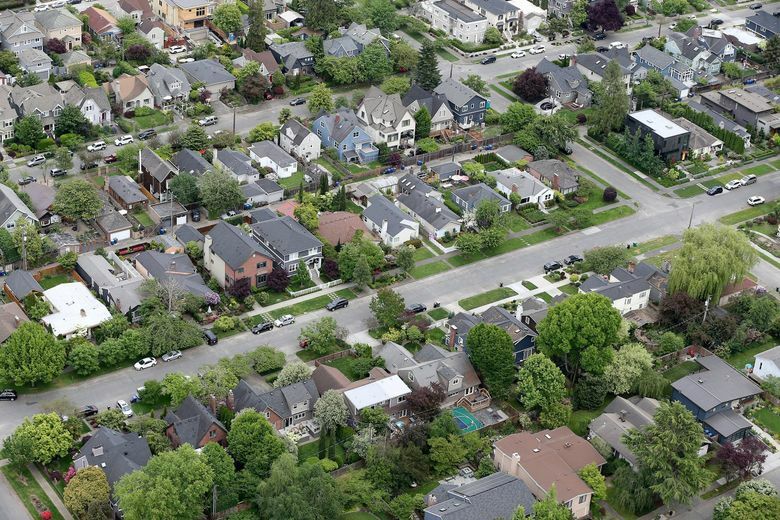 Single-family home prices continue to reach new highs despite increasing inventory in May, according to monthly home-sales data released Tuesday by the Northwest Multiple Listing Service. 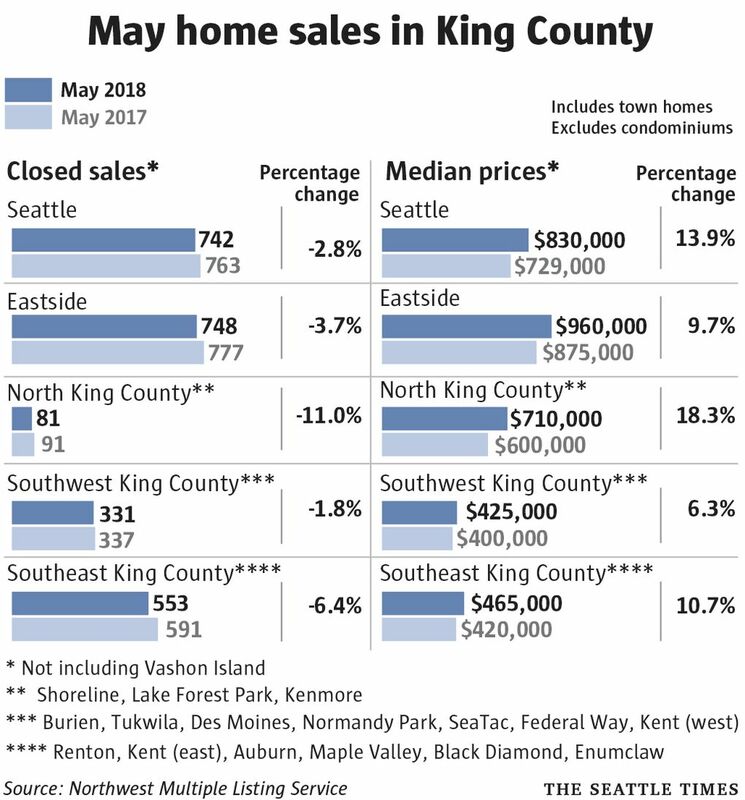 The median price of a single-family home in King County was $726,275 in May, surpassing the record high of $725,000 set in April and up 15 percent compared to the previous year. Seattle’s median home price of $830,000 is up 14 percent from a year ago and sets a new record after holding steady at the previous high of $819,000 in March and April. Another record was established on the Eastside with a median home price of $960,000, eclipsing the previous high of $950,000 reached in February and up 10 percent year-over-year. 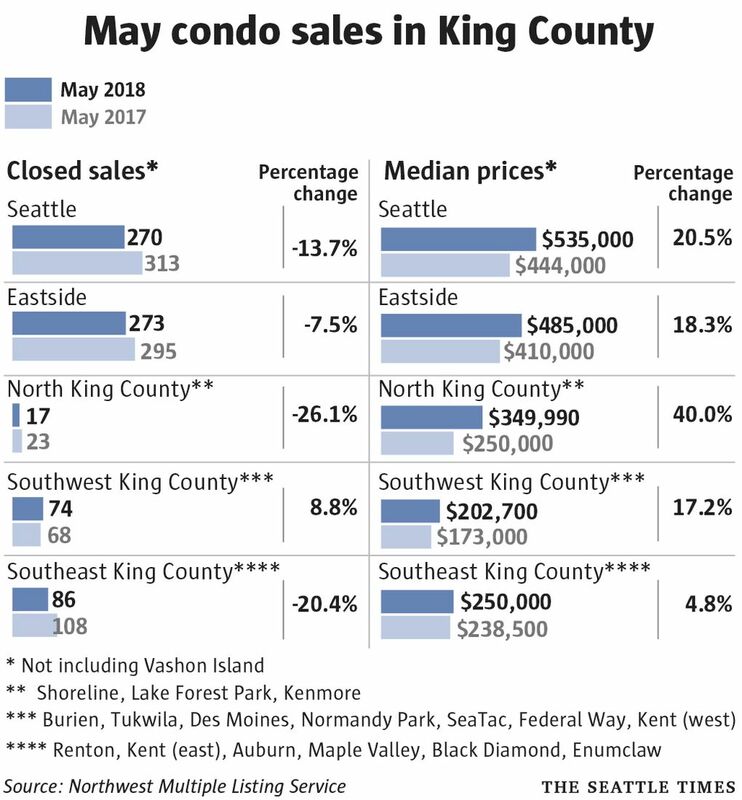 The news isn’t all bad for home buyers, however, as total active listings in King County went up for the second month in a row after years of declining inventory, increasing 36 percent in May compared to the previous year. The Northwest Multiple Listing Service said the increase in listings marks only the third time since October 2016, and the first time since last September, that King County has more than a month’s supply of homes (meaning the number of listings is greater than the number sold in a month). While the increase in inventory may provide some minor relief, it isn’t enough to substantially ease competition among buyers and is still well below the five months of inventory needed for a balanced market, said Mike Grady, president of Coldwell Banker Bain. “The job market in Seattle continues to push higher demand for homes than what we have in inventory being formed,” Grady said. “There’s a little relief, meaning buyers don’t have to write an offer within the first hour. Grady said he doesn’t see inventory even coming close to meeting demand in the next two years. The story is the same in other areas, with both Pierce and Kitsap counties reaching new record highs in May. The median home price of $355,000 in Pierce County surpassed its previous high of $350,000 set in March and was up 15 percent over the previous year. 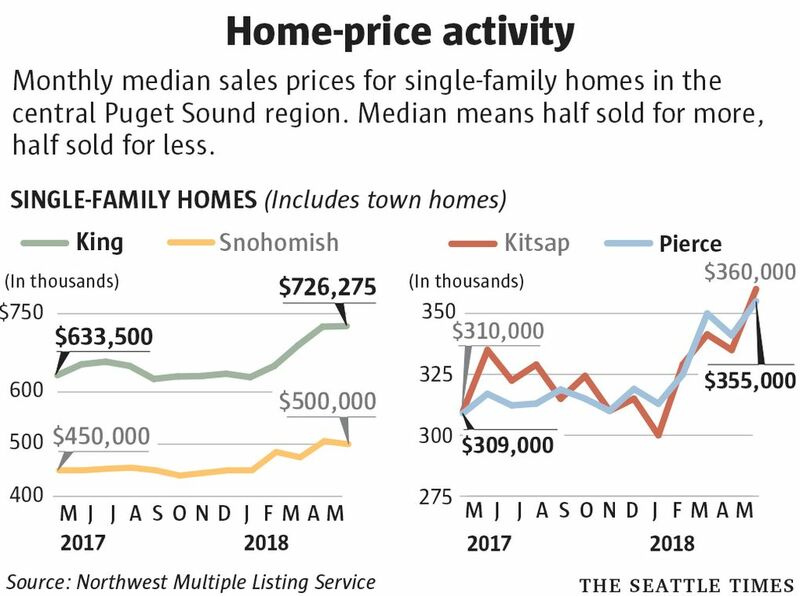 And Kitsap County surpassed its previous high of $341,000 set in March with a median home price of $360,000, up 16 percent from a year ago. Snohomish County came in slightly below its record high of $506,000 in April, but the median home price of $500,000 in May still represents an 11 percent year-over-year increase. The ever-increasing home prices continue to complicate the buying process with a high rate of bidding wars and a median down payment that has surpassed $100,000 in King County. Condo prices experienced more substantial growth than single-family homes in some areas. The median price for a Seattle condo in May was $535,000, a year-over-year growth of 21 percent. North King County saw a substantial 40 percent increase over the previous year, with condos selling at a median price of $349,990 in the area. Among the many factors working against those looking to purchase a home in the current environment, buyers will also have to contend with rising interest rates, which will continue to influence the market for the rest of the year, said George Moorhead, designated broker at Bentley Properties. This story has been updated to correct a price cited in the photo caption.